On June 11, 1982, E.T. entered Elliot’s tool shed and into the hearts of humans across the world. Roger Ebert famously said the Steven Spielberg-directed film was “not simply a good movie. It is one of those movies that brush away our cautions and win our hearts.” President Reagan and First Lady Nancy screened the movie at the White House and, while watching, the President reportedly “looked like a ten year old kid.” It was reported that Princess Diana cried while watching the lovable alien. It made nearly $800 million at the box office (adjusted for inflation, that’s about two billion dollars today), making it the highest-grossing movie ever at that time. In every sense of the word, E.T. : The Extra-Terrestrial was a phenomenon and a money-making machine. Atari was founded almost exactly ten years before the release of E.T., on June 27, 1972 by Nolan Bushnell (the same gentlemen who founded Chuck E. Cheese Pizza Time) and Ted Dabney. Only three months later, the company installed their first Pong arcade game (originally meant to be simply a training exercise for Alan Alcorn and not to be released to the public) in a bar in Sunnyvale, California called Andy Capp’s Tavern. From the end of 1972 through the 70s, Atari installed upwards of 35,000 machines in bars, bowling alleys, and arcades in the United States alone, not too mention thousands more around the world. In 1975, Atari released Home Pong (yes, Pong you could play at home) through Sears just in time for the holiday season. It sold 200,000 units in the first year. By the end of the 70s, Atari was trying to figure out a way to consolidate all of their arcade games and separate themselves from the competitors (Atari had made a couple of poor business and financial decisions, including not filing proper patents). The Atari VCS (later named the Atari 2600) was released in October 1977, but poor marketing and the price point ($199 – equivalent to about $776 today) made it a slow seller. In 1978, Bushnell sold Atari to Warner Bros, though he stayed on working for the company he founded. Under Warner Brothers, Atari flourished. 1979 brought Space Invaders to the home system and reinvigorated sales. Adventure, Pitfall, Pele’s Soccer, and Superman were just a few of the other popular games produced for the Atari 2600 from 1979 through the summer of 1982. Sales doubled in 1980 for the home console and, then, hit ten million units sold in 1982. The Atari 2600 was now the most popular home entertainment system ever produced and had revolutionized how people spent their leisure time. According to the book “All Your Base Are Belong to Us” – a book about the history of video games- it was actually 1981, a year before E.T. the movie was released, that Steve Ross, Steven Spielberg, and Universal began negotiating the licensing rights to turn the movie into an Atari game. The film was released in the beginning of June and the deal was signed in late July for an astonishing $25 million (about $63 million today). They gave the task of designing and programming the game to Howard Scott Warshaw, who had already produced the megahits Raiders of the Lost Ark and Yar’s Revenge for Atari. Everything seem secured, except for one thing. As so often happens to programmers, upper management, in this case Warner Brothers, had promised the software, in this case a game, could be done in no time at all. Specifically, they promised it could be done and released by the 1982 holiday season. That meant the deadline for designing, writing, developing, and programing E.T. would have to be September 1st, approximately six weeks from when the licensing deal had been signed. For reference, a typical Atari game took six months to a year to fully design, write, and program. As you might imagine, right from the start, there were issues. Warshaw presented an ambitious idea that involved E.T. trying to find a special phone to call his E.T. family to pick him up from a special landing spot, while avoiding the adults chasing him. However, Spielberg asked the game play be closer to Pac-Man, considering the short window to make it and the well-worn roadmap a Pac-Man-type game would provide. Warshaw refused and went with his idea. Later, Warshaw admitted Spielberg was probably right, while also saying the game would have been much better if he was just given even one more week. Additionally, Atari had to skip audience/gamer testing, usually a very essential part to game development, because they were out of time. Due to all of these shortcuts and workarounds, they hit the deadline and E.T. : The Extra-Terrestrial for Atari 2600 was released to the world December of 1982 for $39.95 (accounting for inflation, that’s about $100.85 today). 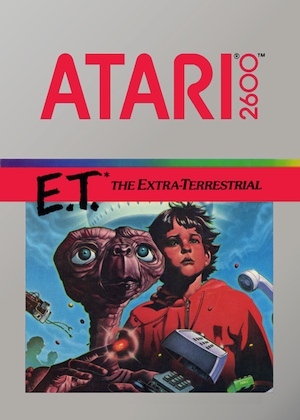 With the hype around the game and Atari’s full anticipation that it was going to be a hit, they produced four million copies of E.T. : The Extra-Terrestrial. Upon its release, it became apparent very quick that they were never going to sell that many copies. The reviews were horrible. Words like “convoluted,” “primitive,” and “monotonous” were often used. Coming with first-hand knowledge (this author has recently played the game), the narrative of the game makes no sense and mostly involves the player controlling E.T. (and his extending neck) as he floats between green spaces. Also, by the time the game was released in December, it was a full six months after the movie. Consumers were getting E.T. fatigue. The game did sell 1.5 million copies, by no means a small amount normally, but nowhere close to the four million copies produced. By the middle of 1983, the game was in discount bins, but they still couldn’t sell it. Atari was stuck with nearly two million copies of a game no one wanted. So, they decided to bury the evidence. Fourteen trucks rambled into Alamogordo, New Mexico in September of 1983. They were carrying the discarded remnants of the most expensive video game licensing deal in history. The trucks went to the city’s landfill and dumped the unsold E.T. video game cartridges into a hole in the ground. According to a New York Times article from September 28, 1983, “Guards kept reporters and spectators away from the area yesterday as workers poured concrete over the dumped merchandise.” Also, according to the same article, the games were produced at Atari’s plant in El Paso, Texas, but due to the failure of the game, the plant had to change what it did- switching to recycling scrap metal. But Warshaw wasn’t correct. It, in fact, did happen. On April 26, 2014, financed by Fuel Entertainment and Xbox who were producing a documentary about the failed game, a team of excavators uncovered many E.T. games buried in a landfill in the New Mexico desert. While the boxes were not intact any longer, the cartridges were, for all intents and purposes, in okay shape. As of the publication of this article, it still hasn’t been reported if the games are still playable or how many precisely are buried there. But the fact that they are there is now indisputable. Atari’s a company that goes from the most explosive and successful company in American history to the fastest-falling company in American history. They went from, like, nothing, to $2 billion in sales, in just a couple years, and then the next year, they lost money. I read somewhere that only a small portion of the remaining cartridges were buried on that landfil, about 150 thousand or so. Also the decision to concrete it was to prevent scavenging on the site and they even guarded it for some time after the burial. Seems that Atari was determinated to delete any evidence of its biggest flop. May have worked at that time but ultimately became a legend.